This week my photo was taken by my lovely Uncle Joe. He took this photo of a praying mantis in my cousin Lisa’s garden in Cyprus. Thank you for sending me the photo Joe it is beautiful. Oh wow, such vivid colours! Wow the vibrant colors are amazing! 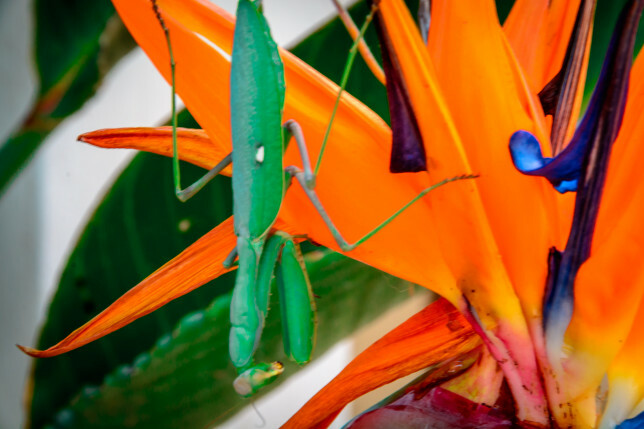 Such a bright inspiring photo; I love bird of paradise plants and to capture a praying mantis on one is just lovely. Love all the colors, the green of the praying mantis against the orange of the birds of paradise. Just gorgeous. Wow that is a stunning photo – what gorgeous colours! yes a very colourful photo. looks great.